✔ Laila Storch is now the focus of great international interest; now 97, she will be featured in new reporting on German television. The subject will be the history of women's accepance into the highest ranks of the world's wind players. ✔ The hope is that the new "net non-neutrality" rules will not affect the Soni Ventorum website. The site itself is quite small, consisting mostly of links. Also, traffic is such that it is unlikely that it could "crash" due to sudden demand. The links are mostly directed to two servers: the "ibiblio" server at the Unverstiy of North Carolina and the "depts." server at the University of Washington. The expectation is that both servers will contunue their service. he hope is that the new "net non-neutrality" rules will not affect the Soni Ventorum website. The site itself is quite small, consisting mostly of links. Also, traffic is such that it is unlikely that it could "crash" due to sudden demand. The links are mostly directed to two servers: the "ibiblio" server at the Unverstiy of North Carolina and the "depts." server at the University of Washington. The expectation is that both servers will contunue their service. ✔ New videos are now appearing on You Tube showing the scores of works featured on the home page under the title "Less-known Masterpieces". It is believed that showing the scores will be of greater use to students - and others interested in these works - than showing just the usual sorts of images seen there. Soon the selection will include some better-known masterpieces as well. You Tube has become an important reference for all kinds of music and now that audio quality is quite decent, it will gain in importance. visit Rhapsody and GooglePlay visit GooglePlay. Spotify is primarily a "streaming" website, where a free membership is offered. (This can result in a surprising pyroclastic flow of hot, loud advertising which interrupts the music. A paid subscription avoids this.) Rhapsody is another streaming website with high audio standards, but offers only a paid membership. GooglePlay is primarily a seller of downloads, with long, generous free sound samples. All three treat each movement of a piece as an isolated "song" and mix them randomly, with no clear indication of who the composer is. The Lyrichord website albums would be a less confusing one to visit and Skowronek's superb program notes are available there. The list of streaming services continues with the recent discovery of these pieces on WiMP visit WiMP and Deezer visit Deezer. We would be interested in hearing from Wikipedia fans how well it works. ✔It is our sad duty to report the deaths in 2012 of two talented people who have been enormously important to the group. 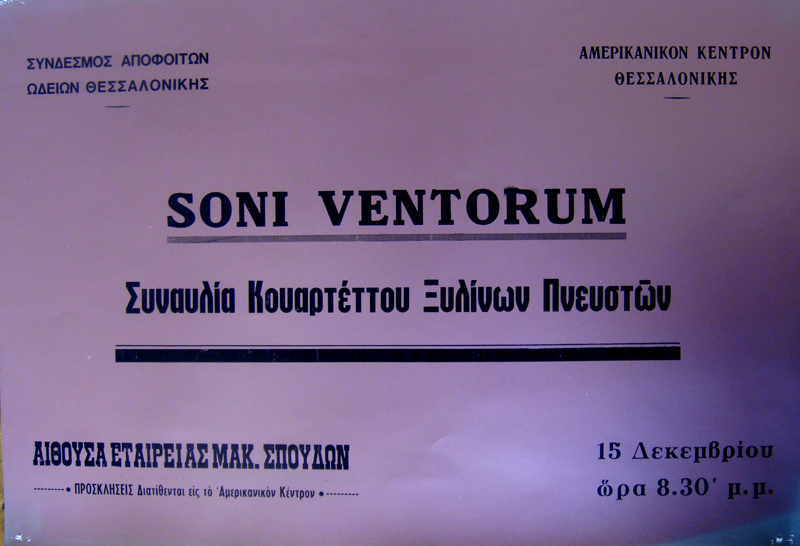 Robert Bonnevie, the superb French horn player who made Soni Ventorum's first commercial recordings for the Lyrichord label in the 1960's, has passed away, Also Neil Skowronek, Felix Skowronek's son, who created this website in 2006 has died. He was a brilliant graphic designer and, although his many storyboards for TV commercials and movies will unfortunately be forgotten, this website, which he created as a memorial to his father, will continue to exist as he designed it (with new material added as needed), and it will stand as his memorial also. 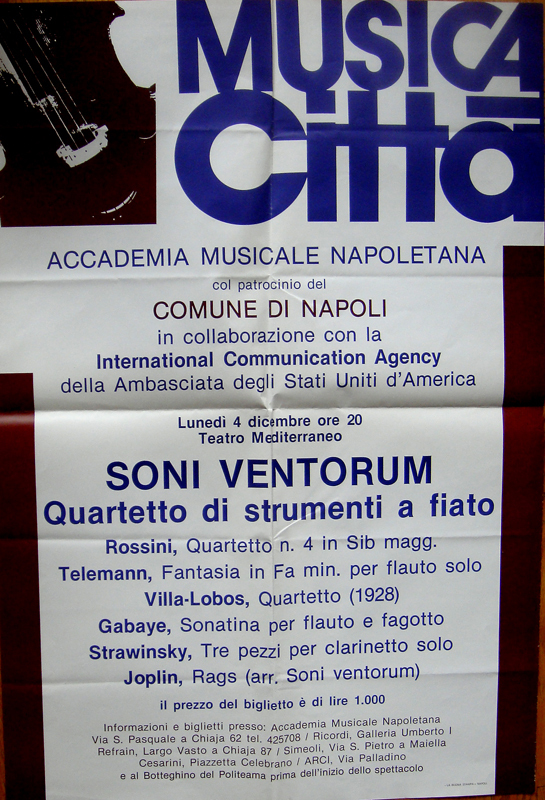 ✔ There is now an entry for the Soni Ventorum quintet in Wikipedia. Article Although still incomplete, the listing will contain some interesting information and some useful links. ✔ Technical matters: all of the music links in this website are in high quality (192 or 224 kbit/s) mp3 format. However all Wikipedia music links, such as the ones in the article mentioned above, must be in the free Ogg-Vorbis format, which some believe to be superior to mp3. A side-by-side comparison is offered here - two versions of the same peformance of the Finale of the Gounod Petite Symphonie: mp3 and Ogg-Vorbis (Speed of download depends only upon how busy the particular server is at the moment, not upon the format.) All newer computers and the Droid cell phone can download ogg-vorbis files, but we are told that it is impossible on the Apple iPad and iPhone. We would be interested in hearing from our visitors about any "fixes" for this problem. ✔ There are many new additions to the list of downloadable performances to be found on the Archive page. All of the woodwind chamber music of Villa Lobos is now there as well as all six Rossini quartets. 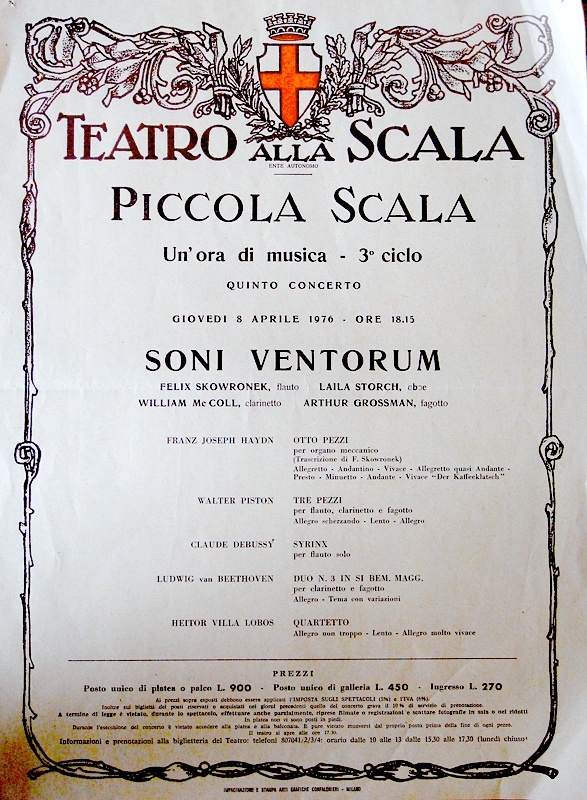 ✔ Among the many fine composers who have written important works for the Soni Ventorum, William O. Smith website stands out as one who has repeatedly challenged and delighted the group. Now a video of a half-hour public television interview from 1995 has become available. video Besides evoking nostalgia for the old days of public television, the broadcast explains much about Smith's remarkable career. 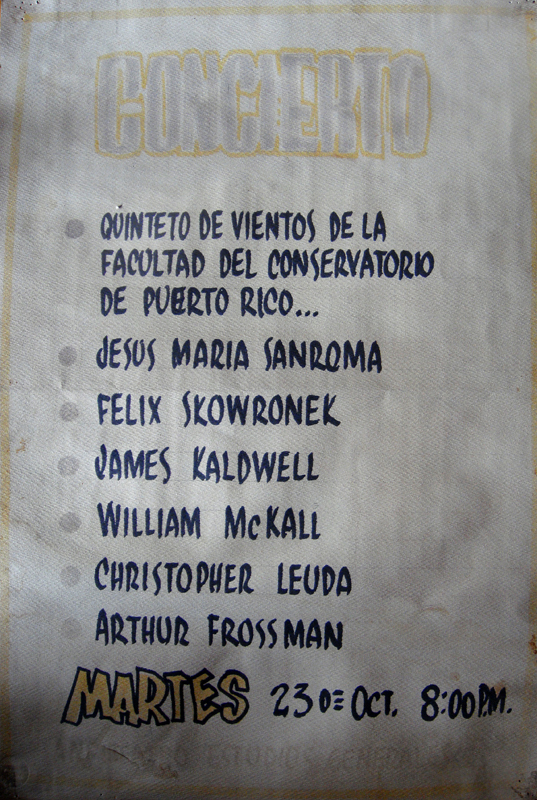 A brief appearance by Joel Barbosa, clarinet, is included at the end of the show. ✔ Other recent additions to the page are works by Janáček, Saint-Saëns, Barber, Babbitt, Ligeti, Milhaud, Françaix, Bergsma and many others. Salonika, Greece: Ankara, Turkey and the group's favorite poster: Puerto Rico. ✔This memoir and biography is already an"instant classic"! Storch, Laila. Marcel Tabuteau: "How do you expect to play the oboe if you can't peel a mushroom?". Indiana, 2008. 594p bibl index afp CD; ISBN 9780253349491, $29.95. Reviewed in 2009jan CHOICE. ✔A newly added rarity is the Villa-Lobos masterpiece, Choros No. 7. This mega-chorinho displays the composer's mastery of what has been called ABCDEFG form; nevertheless, it is almost never performed. Aside from its extreme difficulty, its unusual demands include a Bb clarinet going down to low Eb, an elegant alto saxophone, and the "deal breaker": the ferocious col legno in the violin part! Here Martin Friedmann, the "yeoman of the bow men" leads the group as he demonstrates his sensitive echt-Wiener Bogenführung before turning savage at the end.